Textbooks are expensive, and the web is loaded with free resources. How will colleges manage the digital revolution? Technology is ubiquitous, and Google has the data to prove it. 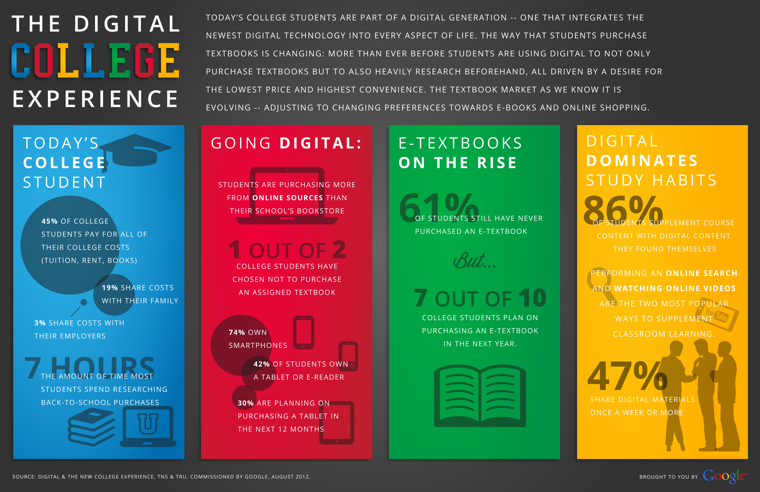 According to their survey “Digital & the New College Experience,” 74 percent of college students own smartphones, and 86 percent have supplemented their courses with free online resources. 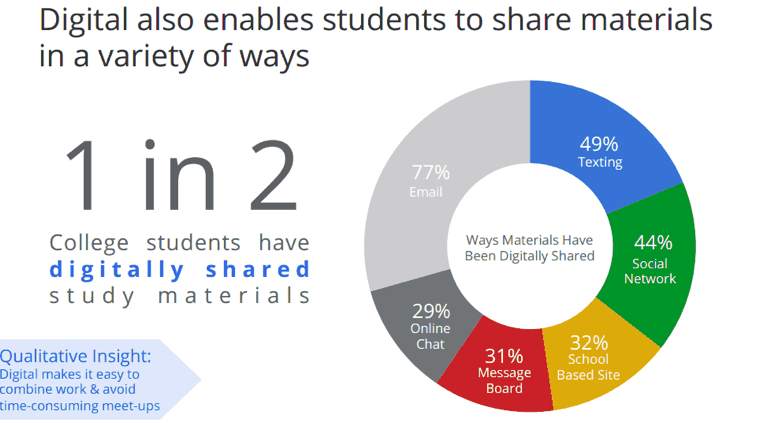 Many of those students — 47 percent, to be exact — share digital learning materials on social media sites at least weekly. The college landscape has changed dramatically in the past few years, and this survey unearthed some fascinating data. Here’s a look at a few key points from the survey, which can be viewed in its entirety below. College students don’t always buy textbooks, largely because of the high cost. E-textbooks and rental programs only partially solve this problem, since costs can still be high and some professors insist that textbook editions be current. So why do online students buy textbooks more often than traditional students do? The survey indicates that 60 percent of distance students always purchase textbooks, compared with 50 percent of students at private colleges and 43 percent at public colleges. Perhaps the lack of in-person class time is an incentive to have a tangible learning resource, or maybe online learners are more engaged. Either way, textbooks are key to education, regardless of the medium or the class format. As the saturation of devices like tablets and e-readers increases, will more students purchase textbooks? Or will the easy access to free resources online further slow textbook purchases? According to Google, 42 percent of college students already own a tablet, and 30 percent of students plan to purchase a tablet in the next year. The landscape is changing quickly, and time is of the essence. There may be enough information online so that students won’t need textbooks at all in the future. Google’s survey points out that almost all students use online resources to supplement classroom learning and textbook content. Sixty-two percent conduct online searches, 51 percent watch videos and 33 percent use message boards. Educators may disagree about whether this has a positive impact on their courses, but the availability of information online is clearly a benefit to the students. The real question is whether professors can begin to do a better job of building supplemental resources into the courses. Half of the college students surveyed have shared study materials online. The college experience has been social for years, but now the learning materials can be shared on the web. Again, educators may not want students swapping information, since it could take away from the learning experience, but this is the way the millennial generation uses the Internet. Message boards, chat rooms and email are not ideal for professors, because information quickly becomes decentralized and hard to track, but this is exactly how repositories of information are built today. Wikipedia, for example, could never have been created unless a multitude of web users contributed. All over the web, information is building up, creating useful resources for students. Social media is driving this phenomenon, and nearly every student access that enables them to contribute to or use the platform. Click the image for a larger view and download the original study here.